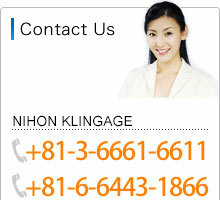 KLEARCOAT Glass is the observing material which NIHON KLINGAGE CO.,LTD. (N.K.G) was first developed in the world. It is produced by coating glass surface with TEFLON® PFA film by a special technique. Coated with TEFLON® PFA film, KLEARCOAT Glass has outstanding resistance to those chemicals that corrode glass; caustic soda, hydrofluoric acid. 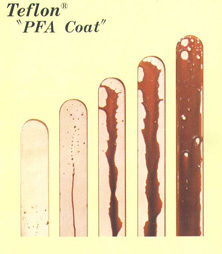 (the only exception being molten alkali metals) It is to be noted, however, that TEFLON® PFA film, like any other thermoplastics, allows a slight degree of permeation. Thicker coating is desirable if the purpose of its use requires non-corrosion. TEFLON® PFA has a better high temperature resistance than any other fluoroplastics. KLEARCOAT GLASS can be continuously used at the temperature of 260℃. Heat cycle test (200℃ to 10℃) shows no observable signs such as peeling. TEFLON® PFA film has a much higher transparency than any other fluoroplastics. The transparency of KLEARCOAT GLASS is also excellent. If KLEARCOAT GLASS should break caused by a high pressure, TEFLON® PFA coating prevents the fragments from scattering and moderates the gushing of fluid. This gives KLEARCOAT GLASS the safety factor required of observing material for pressure vessels. The photographs right show a comparison when a 200g steel ball is dropped from the height of 3m. It is possible for the KLEARCOAT glass to correspond to glass with various shapes of glass for the Liquid Level Gages, various circle glass for the sight glass and the others.